You have added Exotic Brights Printed Maxi Dress into shopping cart. 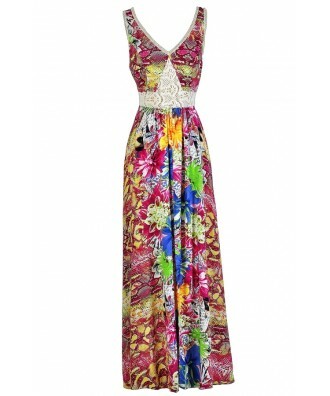 This fun brightly-colored maxi dress has an exotic flair, with its oversized floral and python prints mixed together. 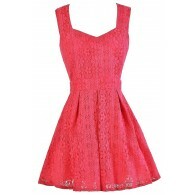 This is the perfect dress to pack on vacation somewhere warm! 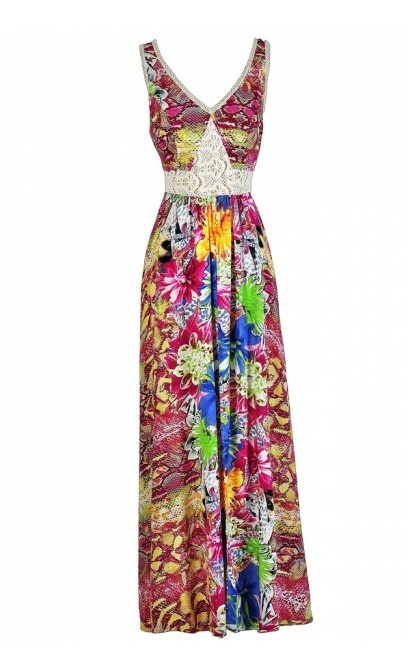 The Exotic Brights Printed Maxi Dress is lined below the waist to the mid-thigh. 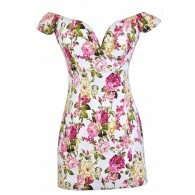 It is made of a flowy fabric with a multi-colored floral and python print throughout. It has a V neckline, wide shoulder straps, an empire waist, and a full length maxi cut. A slit on the side of the skirt allows you to move freely in this dress. 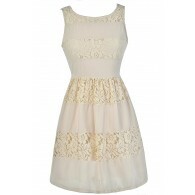 A sheer ivory crochet lace panel at the bodice adds contrast to this look. The back of this dress has a braided design on each side, adjustable spaghetti straps, and a hidden back zipper. This is a fun summer look that pairs well with wedges or flat beaded sandals. Details: Skirt is lined to mid-thigh. Hidden back zipper. 100% rayon. Contrast 1: 100% polyester. Contrast 2: 100% cotton. Lining: 100% polyester. Dry clean only. Small measurements: Length from top of shoulder to hemline: 59". Bust: 34". You have added Exotic Brights Printed Maxi Dress into Wishlist. 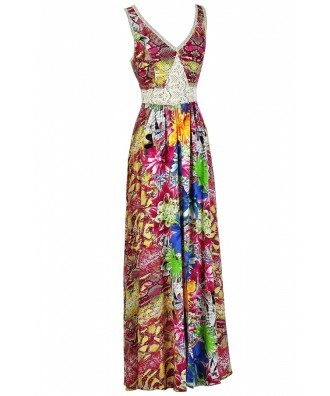 You have added Exotic Brights Printed Maxi Dress for Stock Notification. 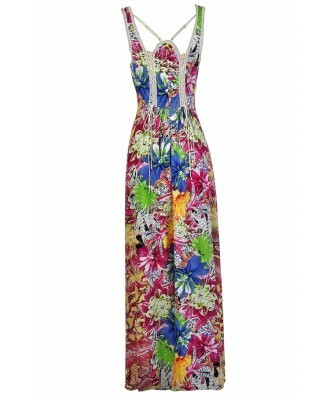 You have set Exotic Brights Printed Maxi Dress as a loved product. You have removed Exotic Brights Printed Maxi Dress as a loved product.